Duck season is almost here and I still had a few teal in the freezer. 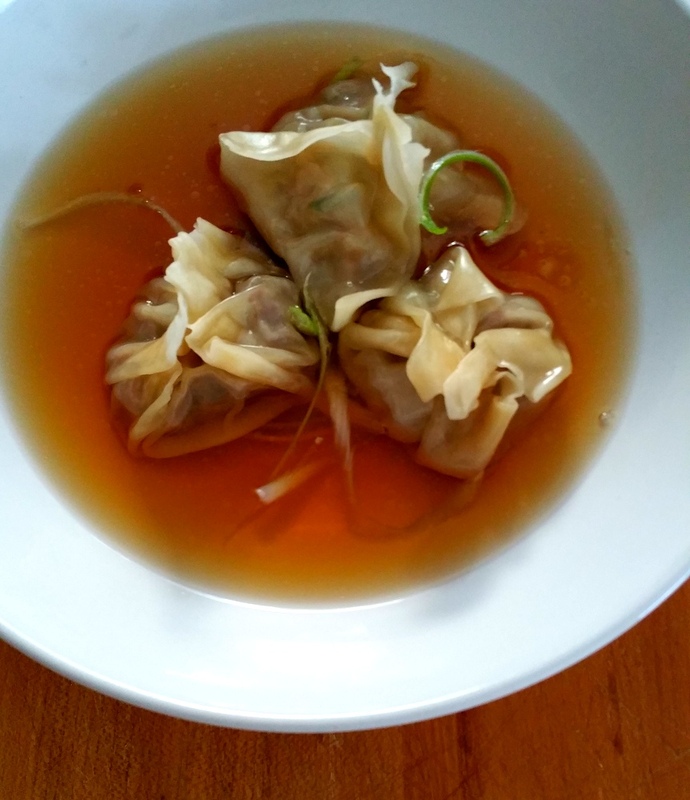 The kids have been asking me to make some dumplings at home. 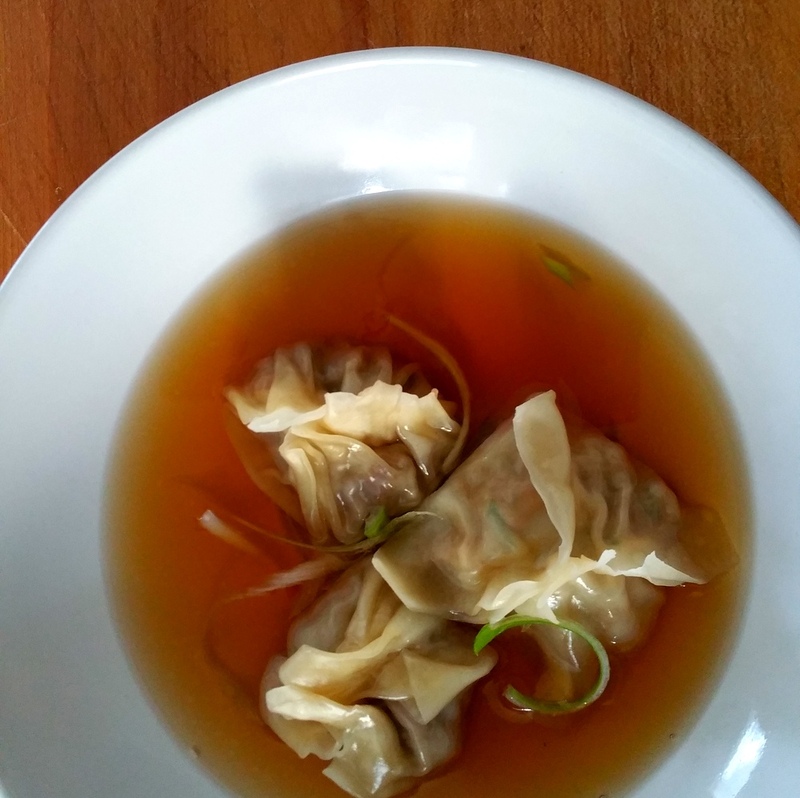 They love steamed dumplings at Chinese restaurants and wanted to see if I can make a version at home. Not one to shy away from a started looking through a few of my books to see what I want to make. 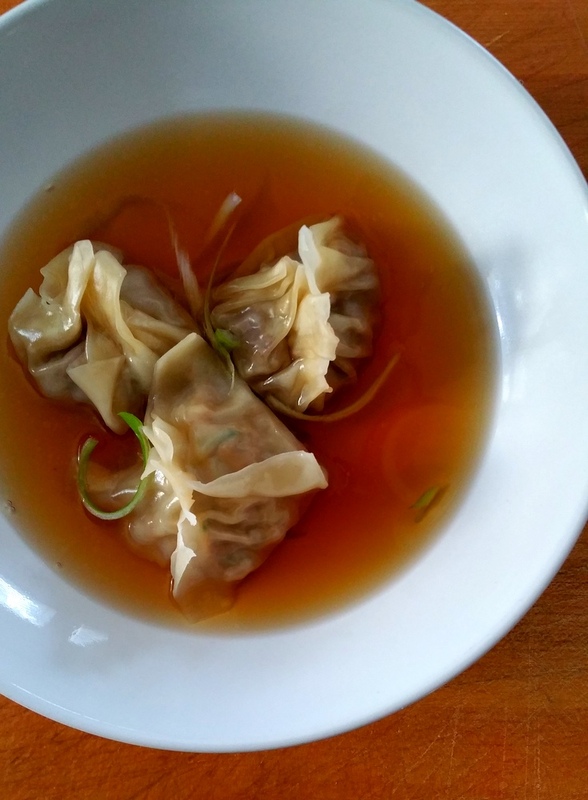 I have made traditional Chinese dumplings at home from Barbara Tropp recipes and was going down the same path but then thought why not make a version that is not easy to find at every good Chinese restaurant in Houston. This recipe from Heston Blumenthal at Home fit the bill. 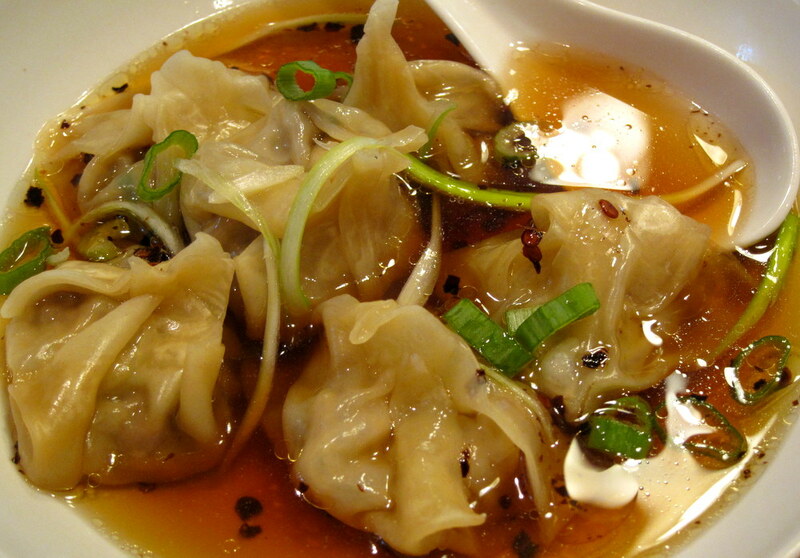 It’s light and refined while still remaining authentically Chinese in flavor, shape and ingredients. First ting I made was the broth. It’s a pork based broth made from roasted pork ribs and chicken along with onions, ginger, cinnamon stick, star anise and Szechuan peppercorns to give it that distinctive fragrant zing. 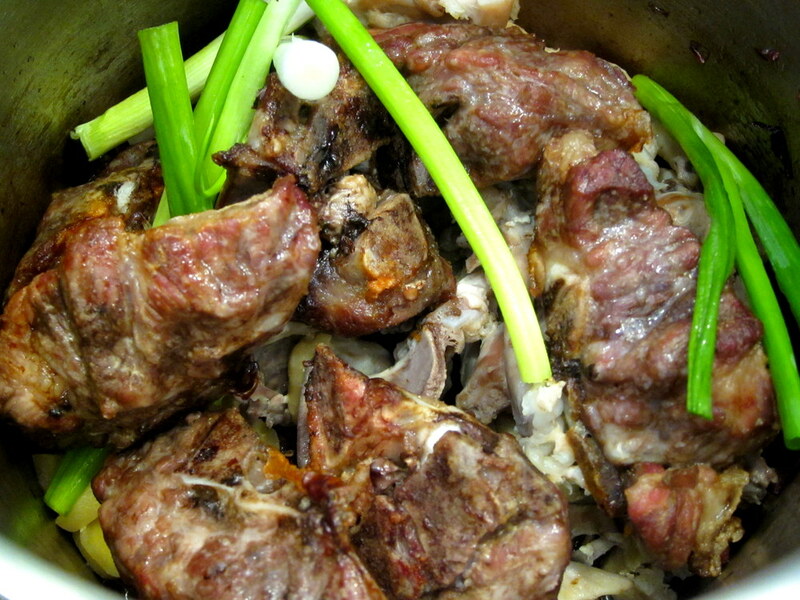 The meat and vegetables get de-glazed with Shaoxing wine (Chinese rice wine). 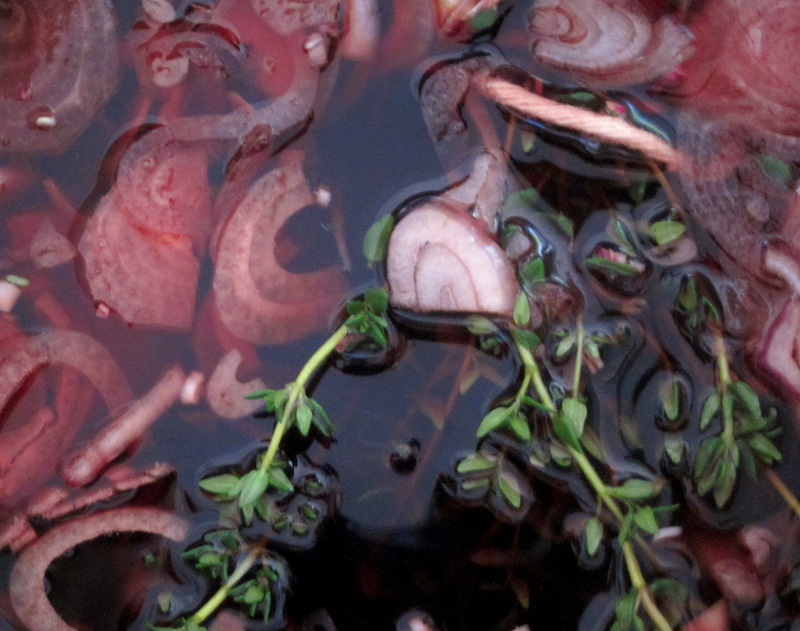 The stock is cooked as usual in a pressure cooker and strained. This makes a delicious stock but taking it one step further towards refinement it gets clarified into a crystal clear consomme. Blumenthal uses his ice-filtration method to clarify the stock. The liquid is set with gelatin and frozen then allowed to slowly defrost in the fridge in a colander with cheese cloth. The clear liquid drips into the bowl under the colander. This works great but is very slow compared to the agar filtration method I talked about here. The two methods basically work the same way but agar sets at a much higher temperature than gelatin, so it can be easily broken up and allowed to leak clear liquid with no need for the freezing step. So, I went with the agar method and got my nice consomme. 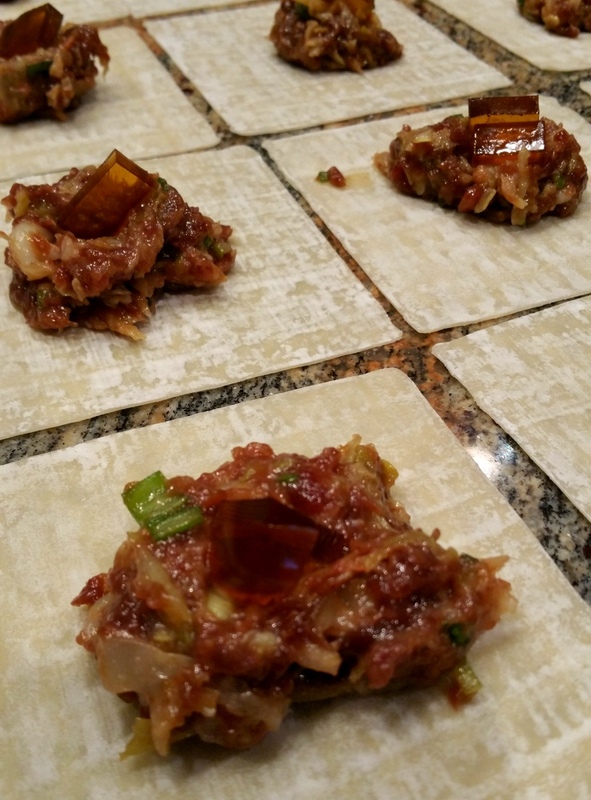 The filling for the dumplings has three components: the meat, the cabbage and the Shaoxing jelly. I made the jelly first. This is nothing more than the rice wine simmered and the alcohol flamed off then it is set hard in a thin (about 1/4 inch) layer with leaf gelatin. When fully set I cut it into small cubes and reserved them in the fridge. The cabbage is Savoy cabbage that is shredded and gently cooked in a good bit of very un-Chinese butter. The meat as I mentioned before is wild duck and some wild goose. I ground it up and mixed it with the cooled cabbage, skim milk powder, egg, soy sauce, ginger and sesame oil. I actually made double the recipe and made the other half with pork filling instead of the duck. 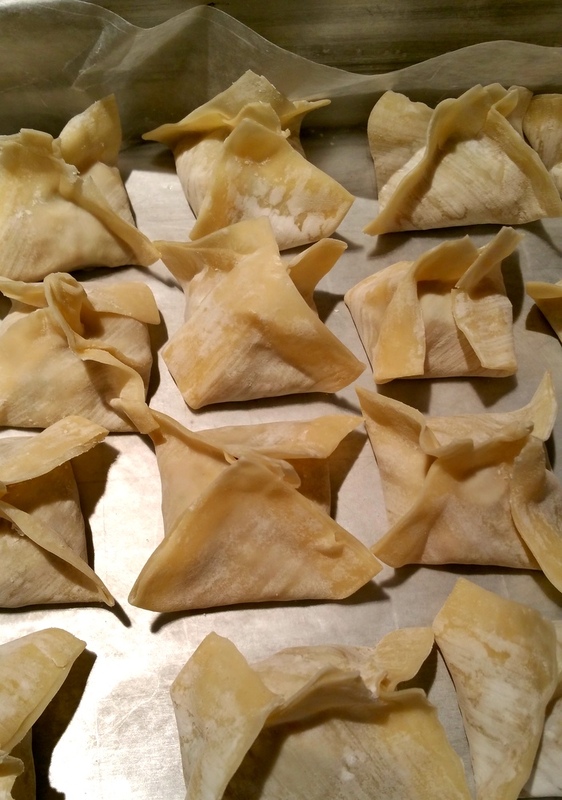 For each wonton wrapper I put a teaspoon of filling and a cube or two of the rice wine gelatin. To distinguish the pork filled ones from the duck/goose ones I shaped them differently. The duck ones were shaped similar to those in the book, sort of like a bundle or parcel. The pork ones had more of an angular shape. At service time I got the clarified broth nice and hot. I adjusted the seasoning and put it to the side. 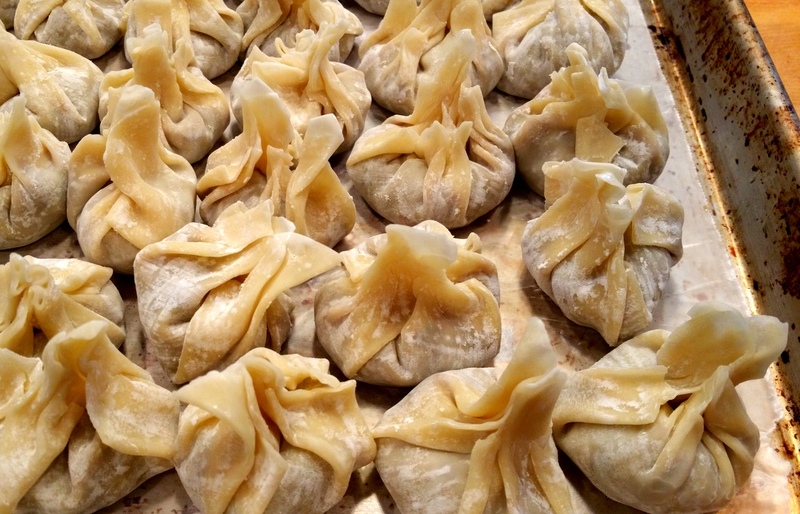 At the same time I got my steamer going and started steaming the dumplings a few at a time. They need about 6 minutes or so to cook through. 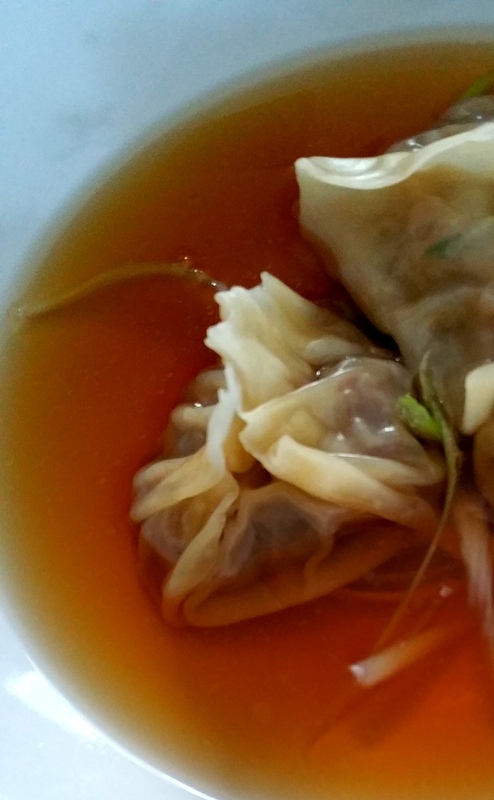 During that time the wine jelly inside melts and each dumpling just bursts with delicious flavor when you bite into it. They were similar to Chinese soup dumplings. When the kids where ready to eat, I plated a few dumplings in a plate on top of finely shredded green onions. The I poured the hot savory broth all around. The kiddos expectations were very high so I was glad they went for seconds and thirds. They might not think this is better than their favorite dumplings at Jade Garden restaurant but they definitely will do in a pinch. Free range chicken like the ones I get from Yonder Way are delicious. These are birds that were never caged and are free to roam around and be as active as they like. The result is tasty chicken but not one as tender as the fryers you can get from the grocery store. These are a bit leaner too. All that means that I cannot just plonk a chicken in the oven and roast it high and fast and it’s good to go. I usually have to cook them a bit longer or use them for fricassees or stews and such. In this instance I had some time to play around a bit, so on spur of the moment while getting ready to joint the bird I ended up just deboning the whole chicken. I had not planned on this dish so I was not sure what the end result will look like. I figured I’ll just choose the flavor profile as I go along. Since the chicken was not going to be “stuffed” with anything like this awesome duck I needed to make sure that the final result is completely encased in skin. So I could not just roll it like a jelly-roll or else I would end up with skin rolled up with the meat where it will never crisp and render. In this case after the bones are removed we end up with more skin that we need. So, what I did was leave the skin attached to one side of the chicken after it was deboned. 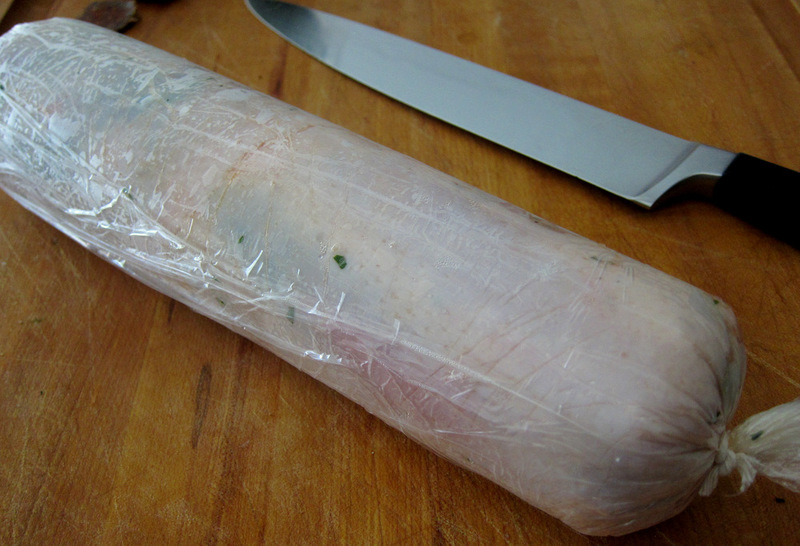 After seasoning the meat side I rolled it tightly with the skin and cut off the extra flaps. 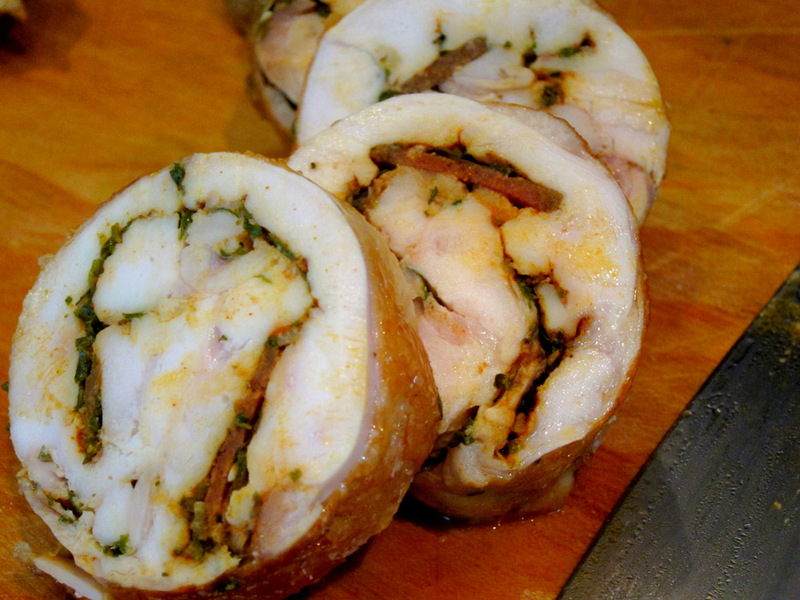 What I had was a nicely rolled chicken with a perfect encasement of skin. Looking in the fridge and spice cabinet for flavors I ended up with a Spanish profile. 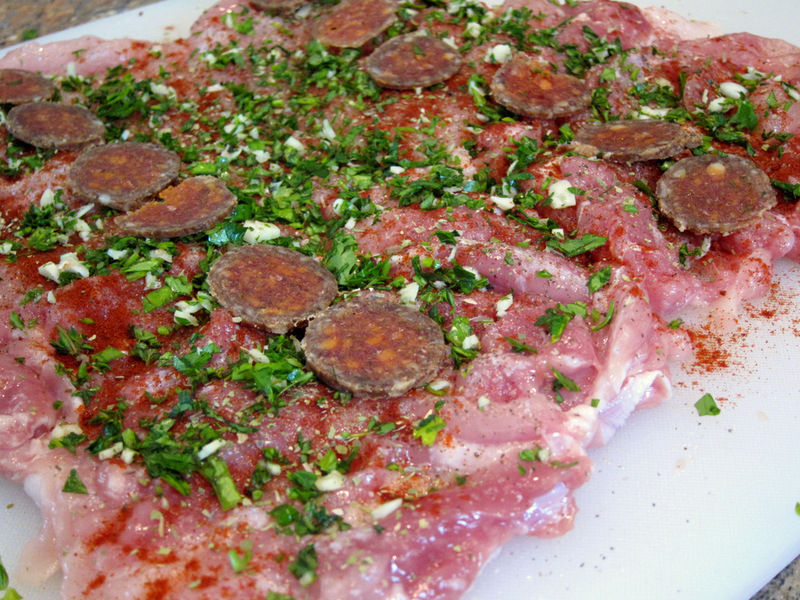 I had chopped garlic (of course), smoked and unsmoked paprika, parsley and last but not least home-cured Spanish chorizo. I had cured the chorizo a couple months back from the book Charcuteria: The Soul of Spain by Jeffrey Weiss and still had a 4 inch piece left. I sliced the sausage thin and laid it in two rows down the length of the chicken. Cooking the chicken sous vide was the was to go here. It will make sure the chicken is perfectly juice all the way through. I used the Sous Vide Dash app to know for sure when the center of the chicken roll is cooked and pasteurized based on the diameter of the meat in a 150 F/65 C water bath. Before serving I patted the chicken dry very well and cooked it on all sides in a mixture of oil and butter until the skin is crisped and golden brown. 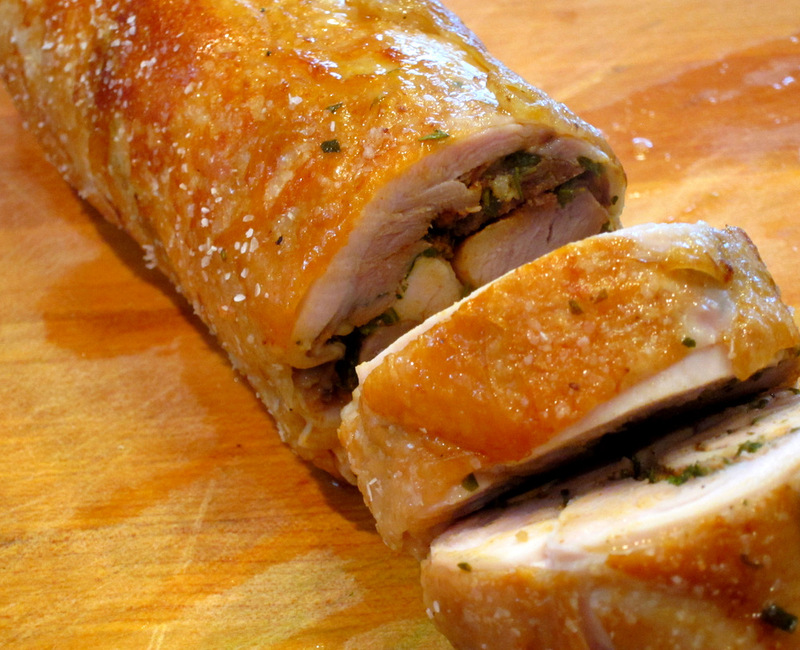 This last step would be even more awesome if I had deep fried the chicken roll for a few minutes. I might try that next time around. While the chicken was happily cooking I had to think about what to serve it with. 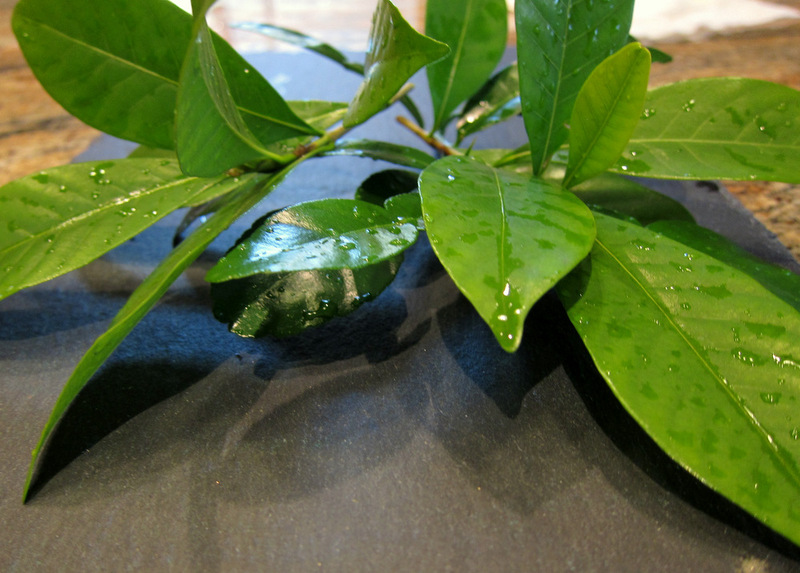 Recently I have been very interested in the new Southern cuisine of chefs like Sean Brock and John Currence. Their focus on ingredients, tradition and flavors that pop has been an eye-opener as to how amazing this type of cooking can be beyond fried chicken and okra (although these are awesome too!). Sean Brock’s episodes on Mind of A Chef are some of the best food television I had ever seen and learned from. In his book (one with the most striking cover BTW), Heritage, Brock has a recipe for tomato gravy that is served with roasted pork, creamed corn and roasted onions. I love that sauce and have made it several times already. So, that’s what went with my chicken. The tomato gravy starts like all gravies, with a starch cooked in a fat – a.k.a roux. In this case cornmeal cooked in bacon fat. Then good quality canned tomatoes are added and the mixture simmers and thickens. The only seasoning here is the bacon fat and some salt and pepper but the gravy gains a lot from the cooking of the cornmeal and the excellent acidic San Marzano tomatoes. It is so good I could really eat it by itself with a spoon or on some rice. I also made the onions from the same recipe. I prefer to use smaller spring onions for these but I had none on hand. 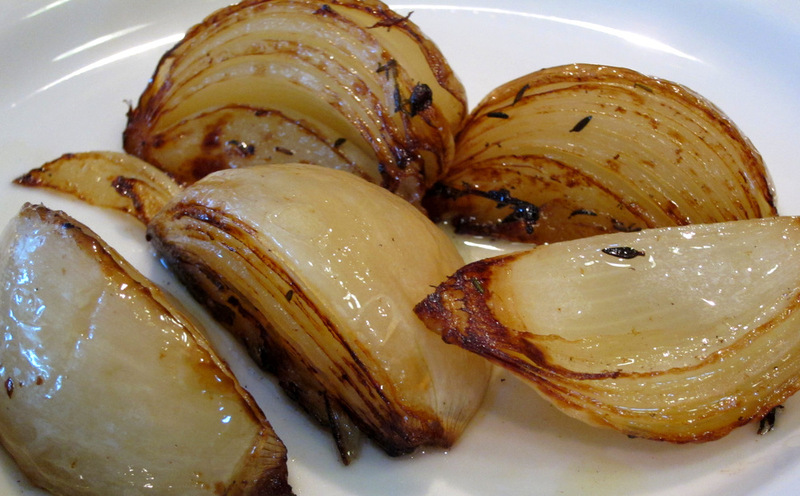 I quartered yellow onions and baked them in foil along with butter and thyme until tender. Before serving I charred the onions in a very hot pan to add some color and caramelized flavor. 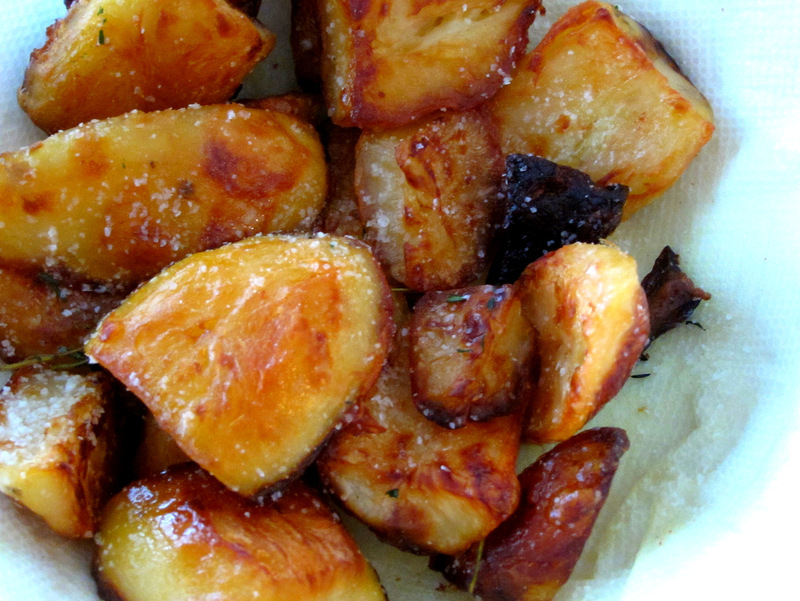 Potatoes would go good with this dish, specifically Heston Blumenthal’s amazing crispy fluffy roast potatoes. The trick here is to boil the potato chunks till they are almost falling apart. This obviously cooks them but also creates a lot of crevices, nooks and crannies that will get very crispy later on. After a cooling period, the potatoes are cooked in a baking pan with a good bit of oil in a hot oven. The process results in amazing crispy on the outside, fluffy on the inside golden brown potatoes and they worked great with the lovely chicken and robust tomato gravy. 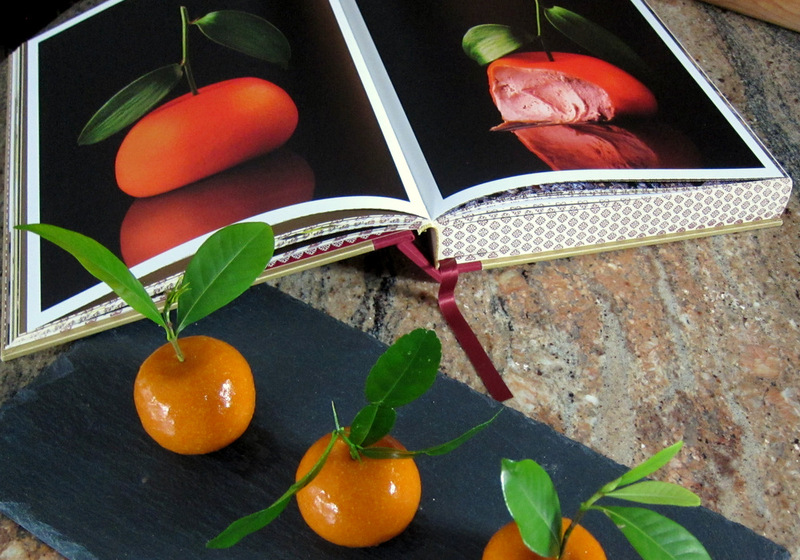 Historic Heston is chef Heston Blumenthal’s tome to historic British recipes. It is really a gorgeous book, hefty and lushly bound, illustrated and photographed. Chef has been fascinated by old recipes dating as far back as the 14th century that he finds in old British cookery (cookery, love that word for some reason!) books. He then extensively researches them, updates them and most end up on his menu at his restaurant Dinner in London. Meat Fruit is probably one of the most famous of such dishes. Curious about other recipes with fascinating names? How about Powdered Goose or Sambocade or Taffety Tart? Well, back to the Meat Fruit, a name that Diana hates even if she loved the actual dish. 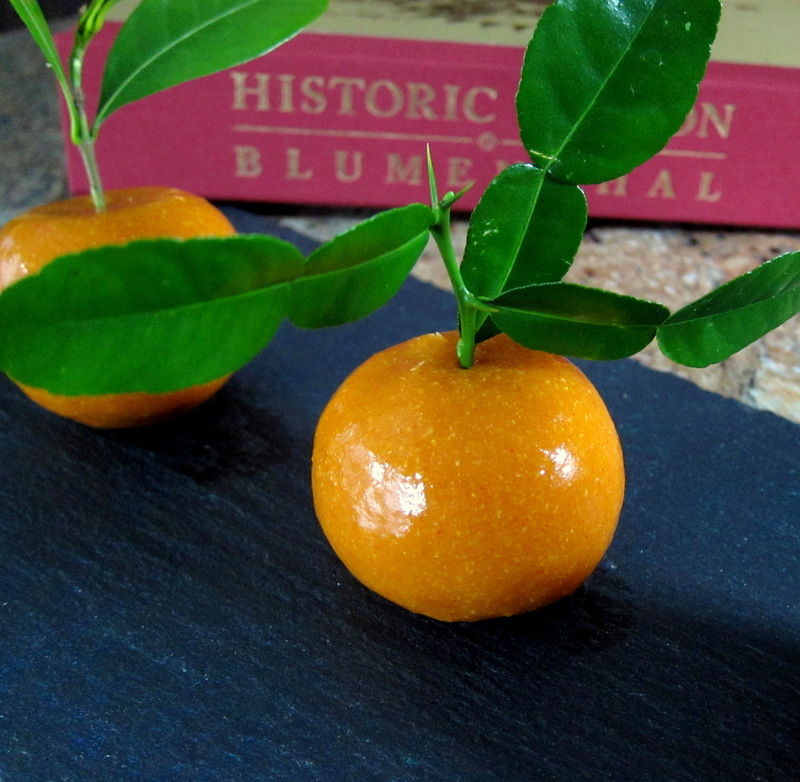 The idea here is to make mandarin that when sliced into appears to be not a fruit at all. 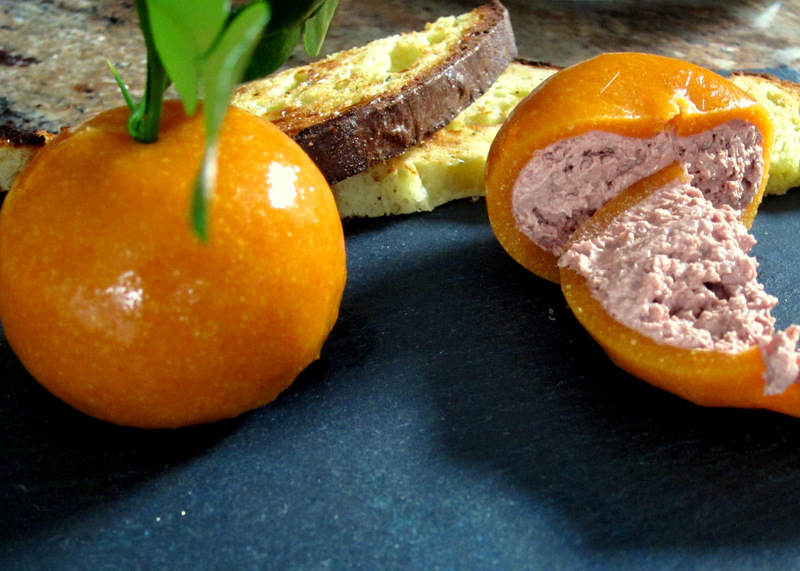 It’s an orb of rich chicken liver mousse with a “skin” made of orange. 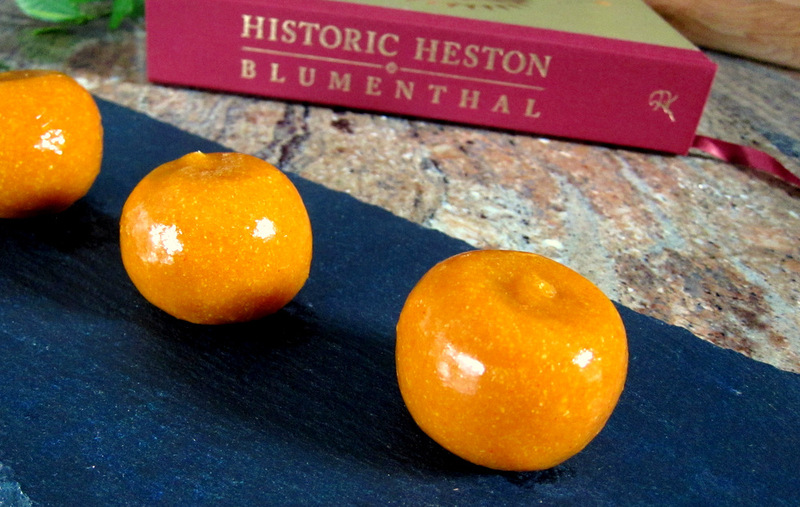 This is the only such recipe that Blumenthal provides for Meat Fruit but he does mention other variations like a sausage mixture made to look like grapes or apples. 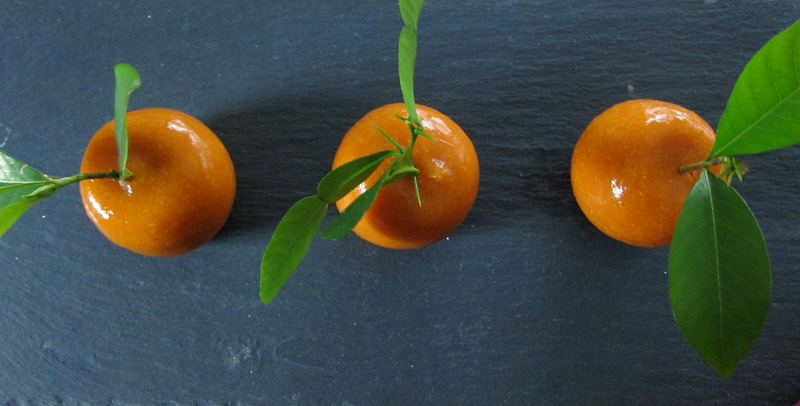 It’s a relatively easy process to make the mandarins once the chicken liver parfait is prepared and piped into hemisphere molds. The molds are frozen solid and each two hemispheres are then combined to form a neat sphere. 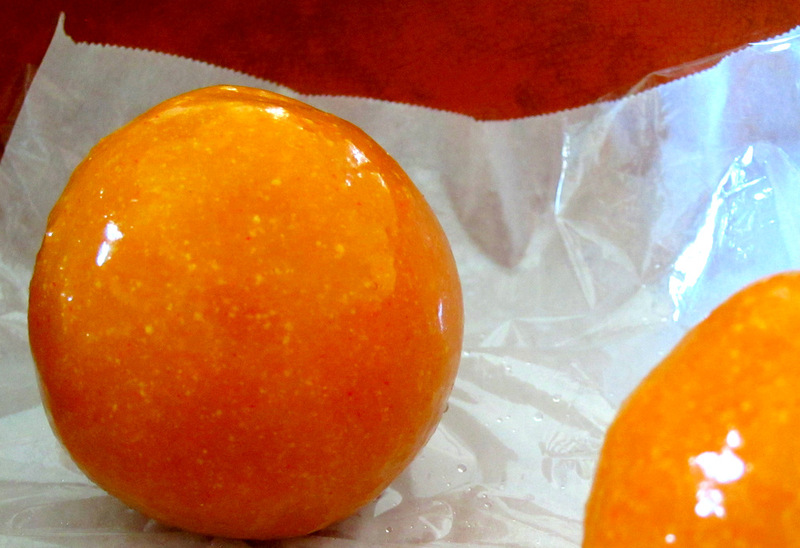 Each sphere is wrapped tight and put back in the freezer waiting for the next step. To make the “skin” of the mandarin I combined a mixture of mandarin puree, gelatin (a whole lot of gelatin sheets), glucose and a touch of paprika for color. 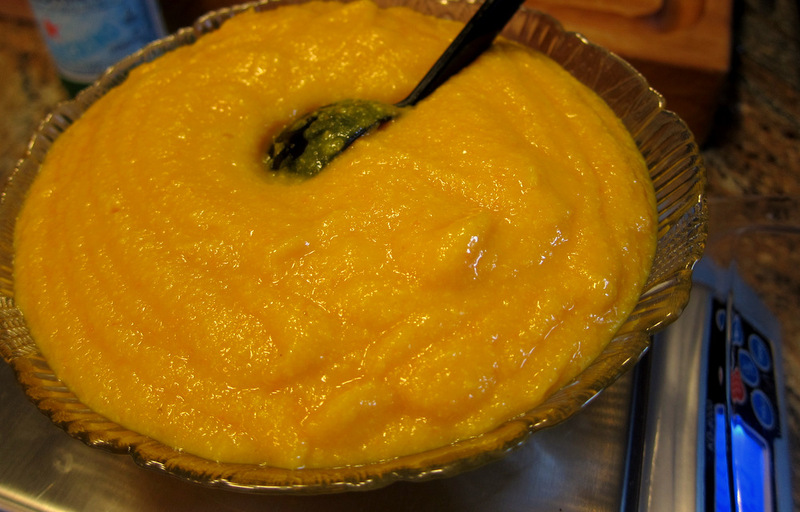 I made my own mandarin puree by cooking several of the quartered fruit (peel and all) Sous Vide until they were soft. I blitzed them in the blender to make a smooth puree. 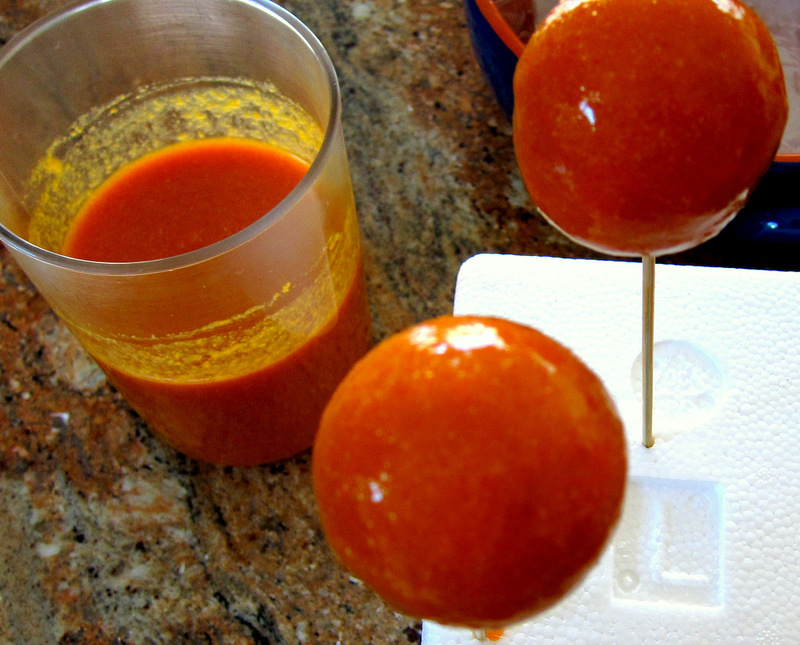 I put the frozen parfait spheres on skewers and used that to dip them into the mandarin jelly two times. After every dip in the mix the spheres went into the fridge to set for a few minutes. I do think maybe my jelly was a bit thicker than Blumenthal intended. My mandarins’ skin came out a bit thicker than it should be. At this point the chicken liver mandarins need to sit in the fridge for a couple of hours so that the parfait can thaw and soften for service. The final touch, right before serving is to put a small twig into each “fruit” to give it a nice realistic look. 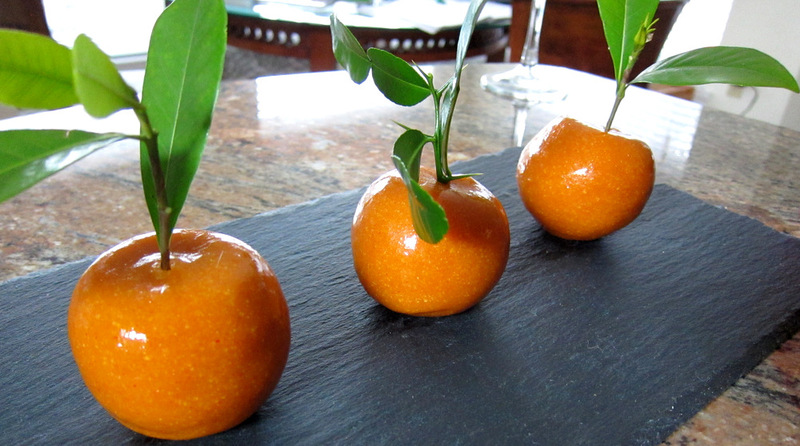 The finished meat fruit look very convincing and just damn cool. These are not just gimmicks though. I’ve already talked about how delicious the chicken liver parfait is and now with the sharp citrusy mandarin skin it is a complete package. I toasted some good bread (sourdough and brioche), rubbed the slices with herb oil and cut into the Meat Fruit. I cannot think of too many appetizers as impressive as this. 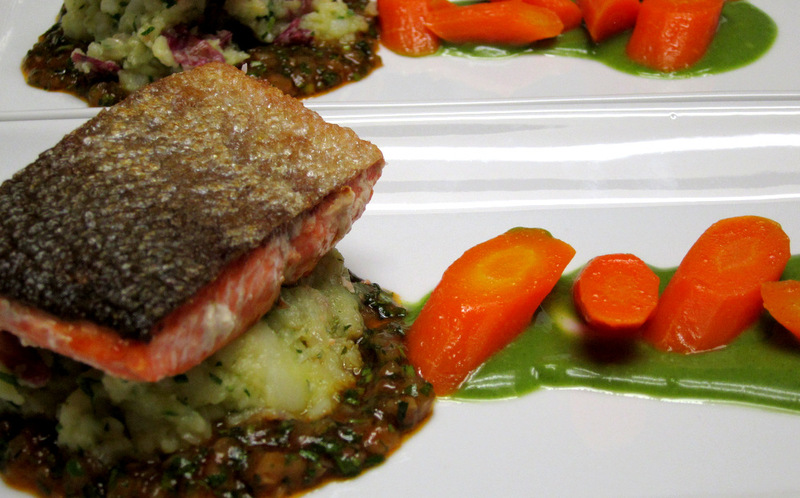 It’s a dish that has a rich history, it looks stunning, it’s whimsical and simply delicious. I hesitate to call anything perfect or the ultimate or the best, but really this chicken liver parfait is it…at least for now. 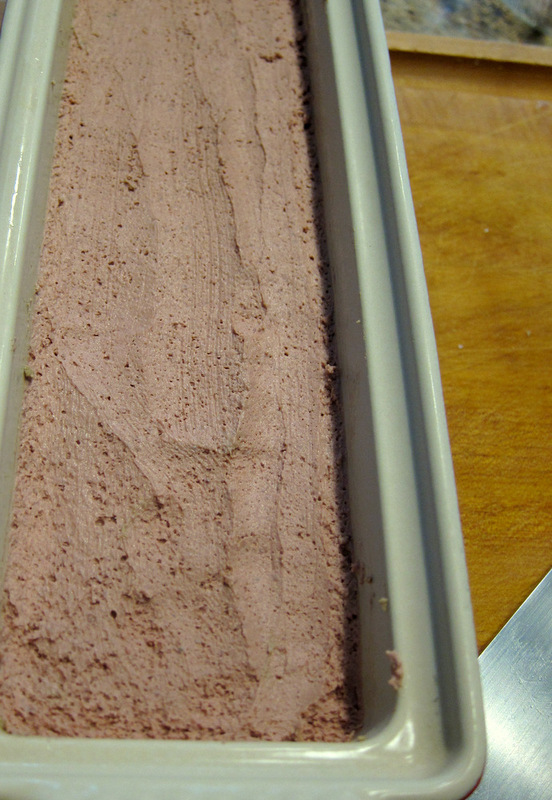 I have made rich and decadent chicken liver mousse before but this recipe (itself part of another recipe) uses a couple of techniques that result in the most luxurious pink hued chicken liver parfait ever. The flavor is superb with the strong liver minerality working in perfect harmony with the wine, butter, shallots and herbs. The main problem with chicken liver dishes is the texture – well, at least for me it is. That grainy sometimes chalky chopped liver texture is loved by some but I find it very off-putting. This is usually due to the liver being overcooked at too high of a heat. 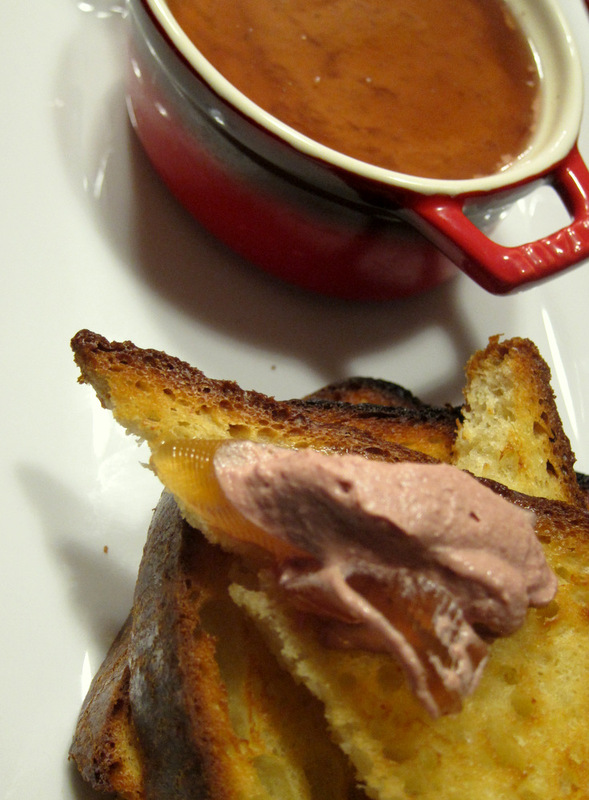 When making chicken liver mousse or parfait it’s very important to cook the meat properly. Most recipes will just have us puree the liver with the rest of the ingredients and cook in a ramekin or maybe saute the liver and then puree it with aromatics and such. Blumenthal goes through an extra step or two that are very much worth their effort. 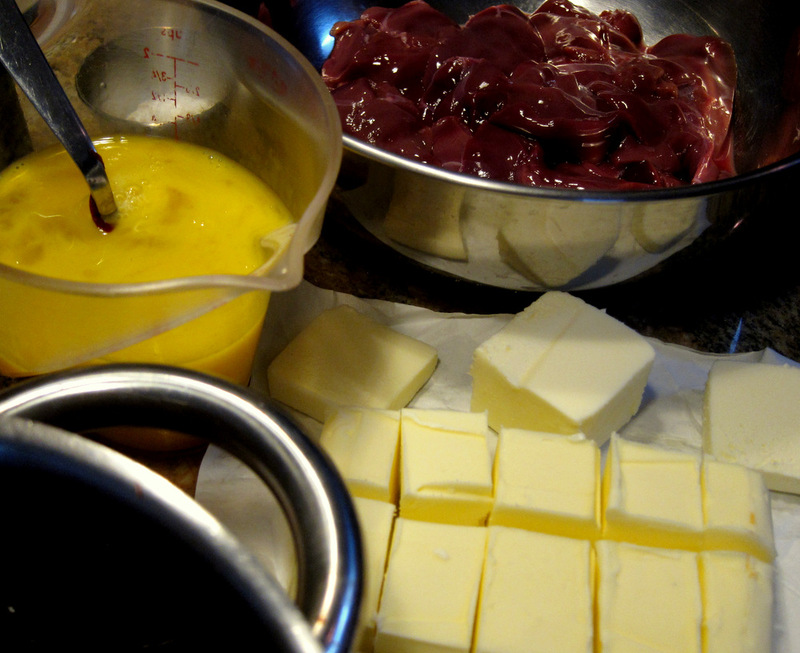 The primary ingredients of the parfait are cleaned and de-veined chicken livers (free range ones from Yonder Way Farm), eggs mixed with a flavorful liquid reduction (port, wine, brandy along with shallots and herbs) and a whole lot of butter. The butter weight is actually almost equal to the meat weight! The livers (seasoned with salt and curing salt), egg mixture and butter all go in separate bags and are placed in a water bath heated to 50 C with an immersion circulator. The bags stay in the water for about 20 minutes. This temperature and time are obviously not long enough to cook anything. The purpose is to bring everything to the same warm temperature. 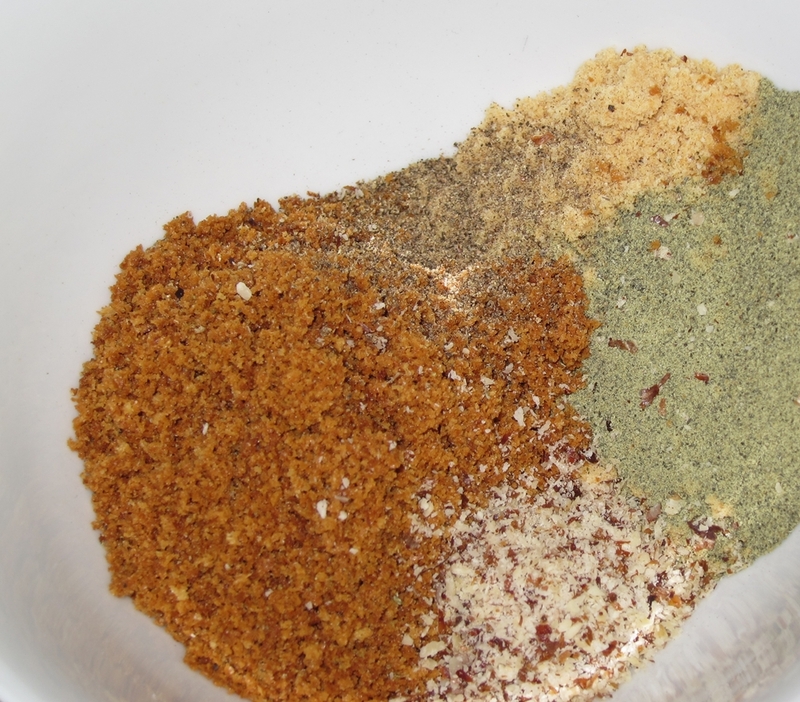 This helps insure that when I blend the three mixtures together the parfait mix does not split. Mixing cold butter with cool chicken livers and room temperature eggs can really end up hurting the texture. This is where top level chefs separate themselves from the rest. Attention to the crazy minute details. Maybe making sure that the components of the chicken liver parfait are at the same warm 50 C temperature is a little thing. Maybe it does not make THAT much of a difference. These little things though do add up and make something that is very good great. 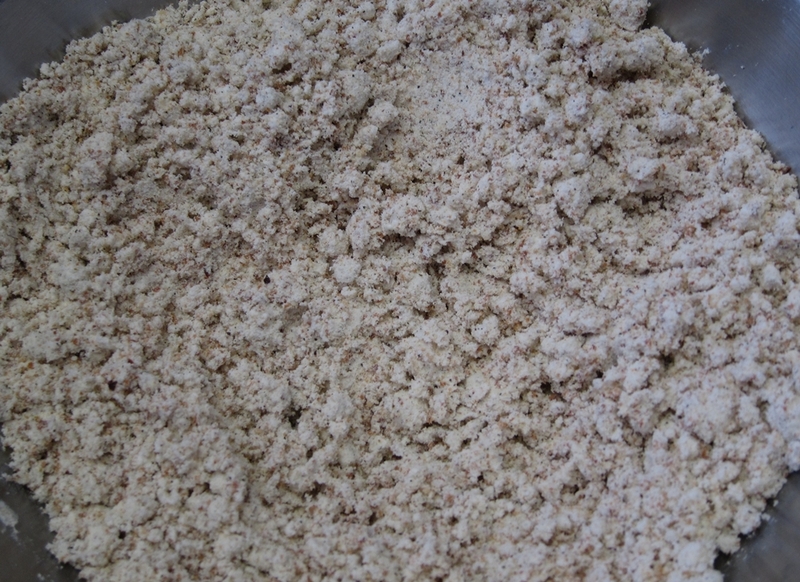 The other step to really get that texture just right is to pass the blended liver mixture through a very fine sieve. Now the parfait is ready to cook. The mixture goes into a terrine pan that sits in a pan of very hot water (a bain marie ). The parfait is a custard that needs to cook gently like any flan or creme caramel. This one cooks for about 35 minutes in a 212 F oven until the center registers about 147 F on a thermometer. Another issue with preparations like this is that the cooked parfait gets an unattractive greenish dark layer on the surface due to oxidation. 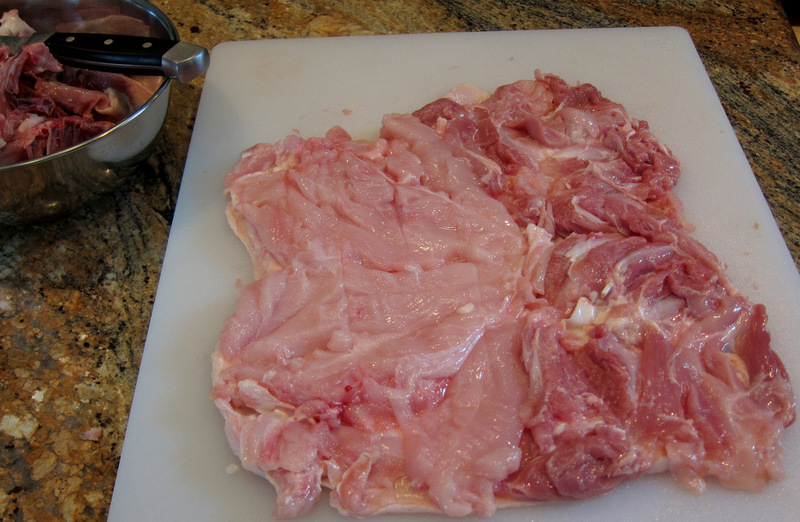 Even with the Sodium Nitrite (the curing salt added to the livers) this discoloration will still happen). This only gets worse after the parfait sits in the fridge for 24 hours to set. That ugly layer also has a strong flavor. 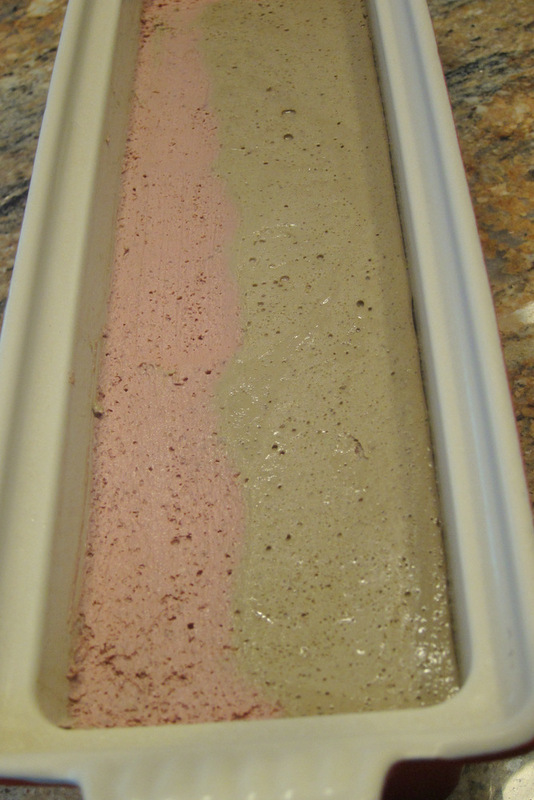 So it messes up all the hard work we’ve been through so far to make a beautiful creamy dark pink chicken liver parfait. The solution? Well, very easy really. Just scrape it off before transferring the cooled parfait into another container. 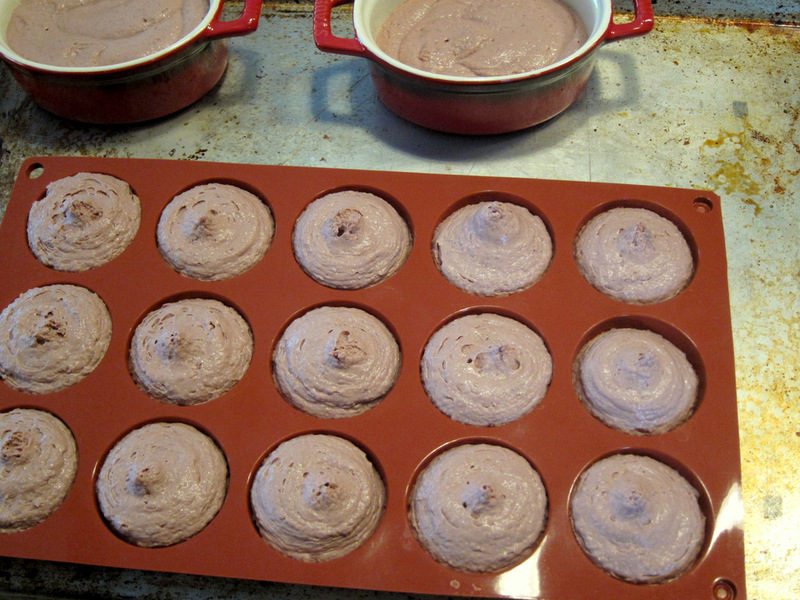 I put the parfait into a piping bag and piped most of it into small silicon half sphere molds (more about that in the next post) and the rest went into a couple of small ramekins. If I leave the the ramekins like that with the surface of the parfait exposed the will develop the oxidized nasty top layer again. 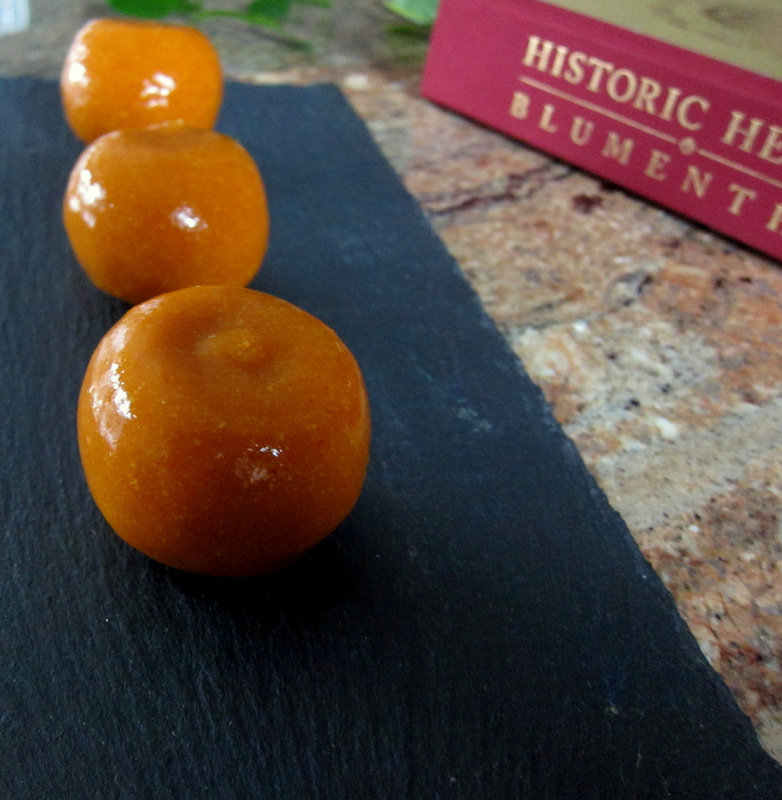 So, I quickly made a vinegar gelèe with apple cider vinegar and little sugar and gelatin. It’s the same idea as the one I made before for the “Faux Gras” but this time I left the vinegar mixture totally clear instead of mixing it with parsley. The gelèe both protects the parfait and makes a delicious tart condiment for the liver. The parfait topped with the gelèe like that can sit covered in the fridge for a couple weeks with no problem. We ate the contents of the two small ramekins smeared on toasted brioche with a glass of crisp white wine. This really is the best chicken liver parfait we’ve ever had. It is luxurious, rich, creamy, smooth and has a marvelous flavor. The fourth and final course of our Valentine’s Day dinner is one I am very proud of. It worked so well and was a delight to make, look at and eat that I could not have been happier with how it turned out. Well, like everything, it can be improved upon and perfected some more, but really it was a lovely ending to a delicious meal. It’s a take on the traditional French dessert known as Mille Feuille meaning a thousand sheets, a reference to the many layers of flaky puff pastry. 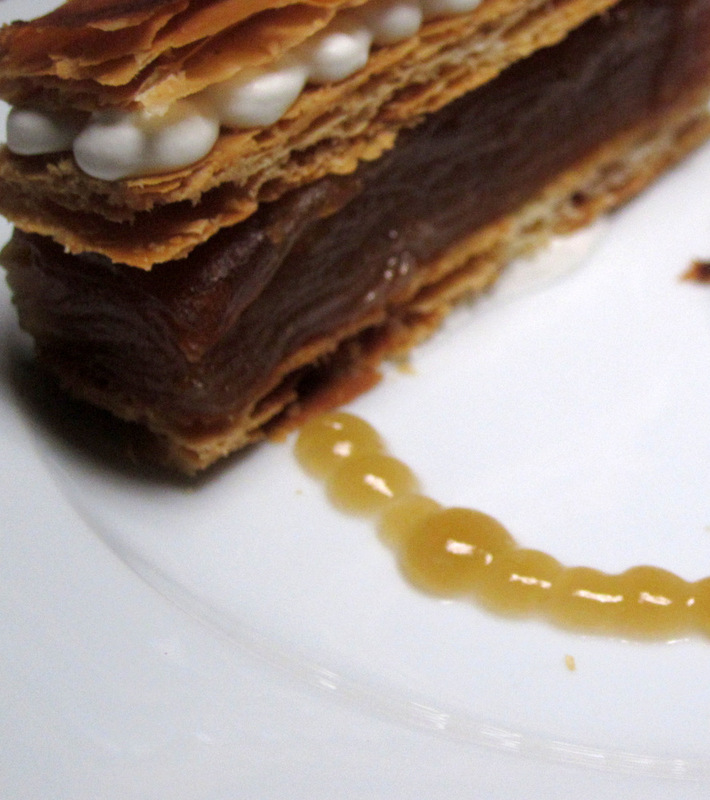 Another name for this type of dessert is a Napoleon. 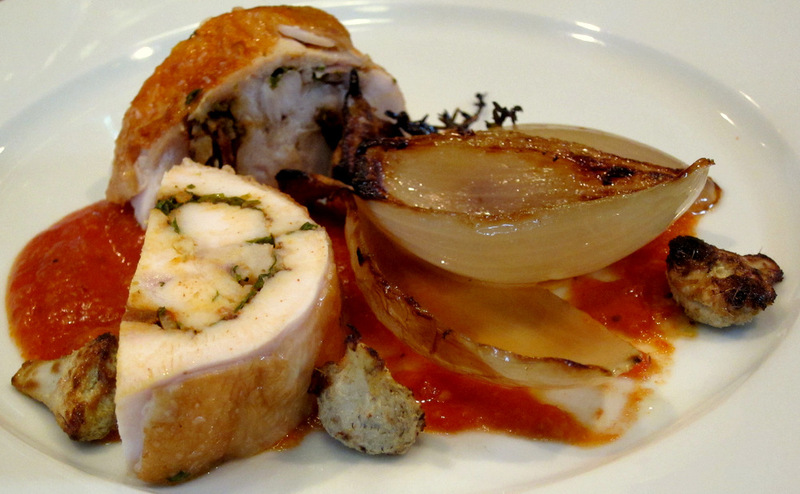 The inspiration of this recipe is from both Daniel Boulud and Heston Blumenthal. 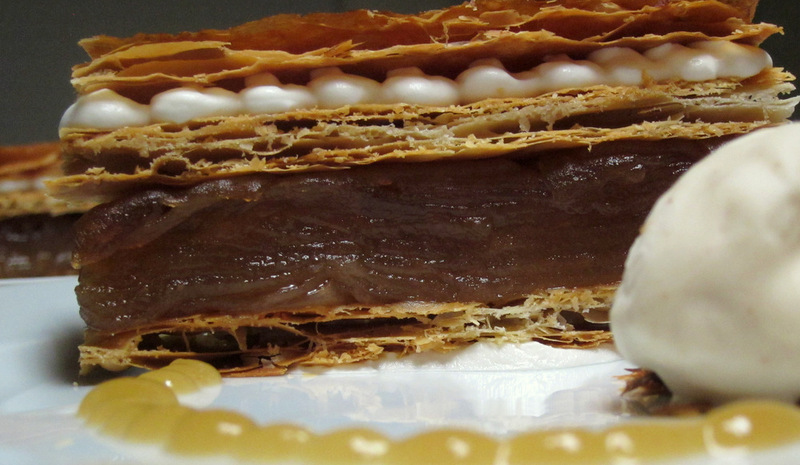 Heston has recipes for a dessert with candied apple and puff pastry in at least two of his books and they look spectacular with layers of caramelized apples, cream, apple confits, ice cream and such. Auldo prepared the version from The Fat Duck Cookbook, simply called Cox’s Apple, on his blog a while ago. 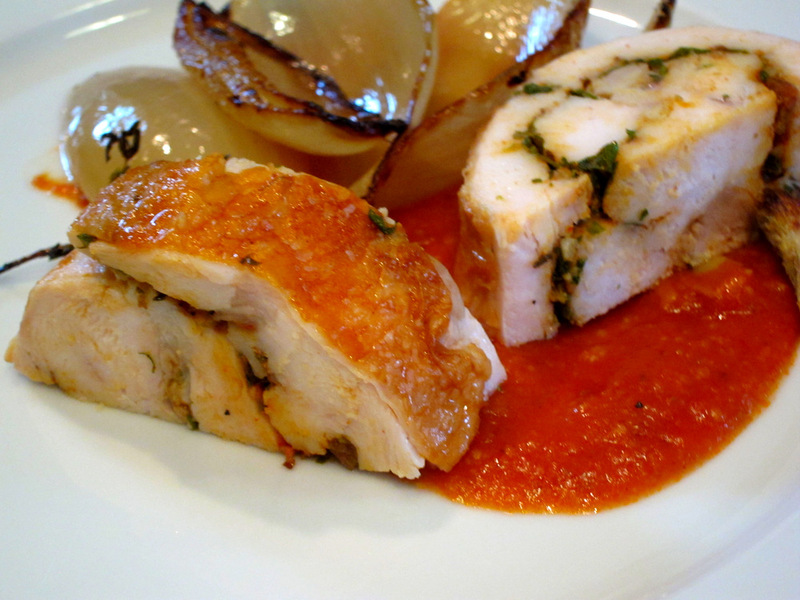 More recently I saw a simpler but also very refined version in Daniel Boulud’s latest book Daniel: My French Cuisine. 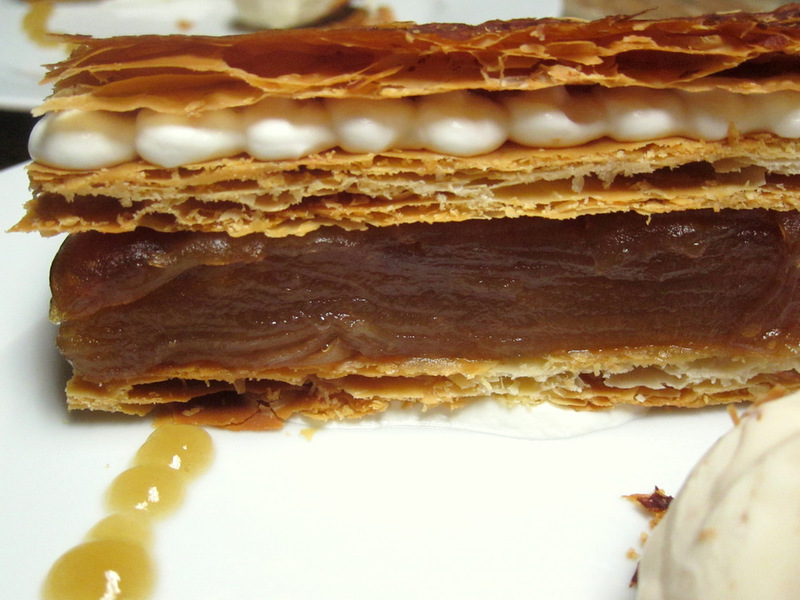 Boulud’s version is a layer of candied apple confit sandwiched between puff pastry and a layer of whipped calvados cream topped with caramelized puff pastry (aka an arlette). 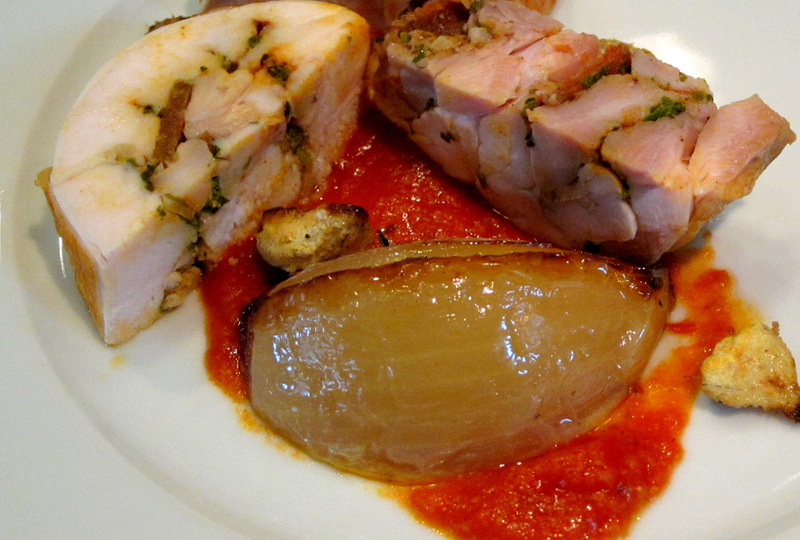 The apple confit layer is simple to make following Boulud’s instructions. Thinly sliced apples are layered with raw sugar to almost fill a small loaf pan. This is then covered in foil and baked until the apples are deep mahogany caramel color. The confit is then cooled and frozen to make slicing it easier. This process works very well, but next time around I’d rather put a layer of parchment in the bottom of the pan or at least butter the pan. This would’ve made removing the block of apple confit much easier. I was hoping to make my own puff pastry but really got tight on time with the other dishes I needed to prepare. So, I opted to buy some good quality all-butter puff pastry. The key here is to buy the puff pastry made with only butter, not the Pepperidge Farm crap. I cut the pastry into large portions and baked some on a baking sheet weighed down with another baking sheet to control how much the pastry rises. These were then cut into even rectangles and formed the first two layers of the plated dessert. 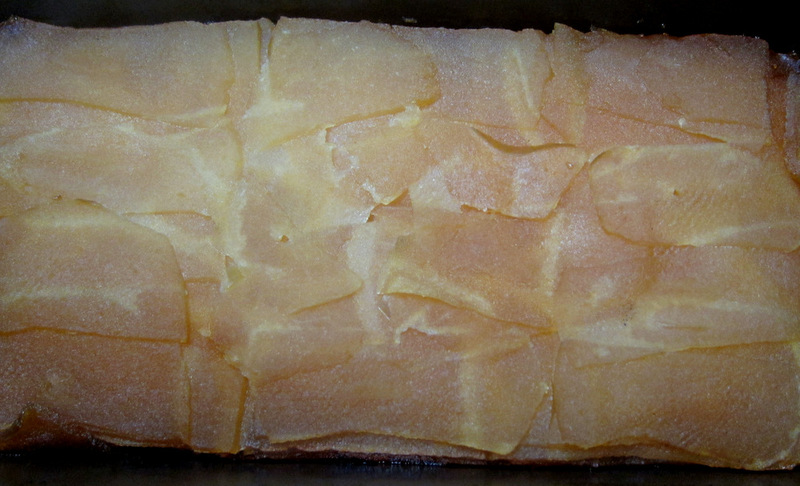 The third (top) layer was the arlette, the caramelized thin puff pastry. I used Blumenthal’s instructions to help with this one. The pastry is rolled thin while constantly being dusted with confectioner’s sugar. Then it is baked with additional weights on top to keep it on the thin side as it cooks and caramelizes. 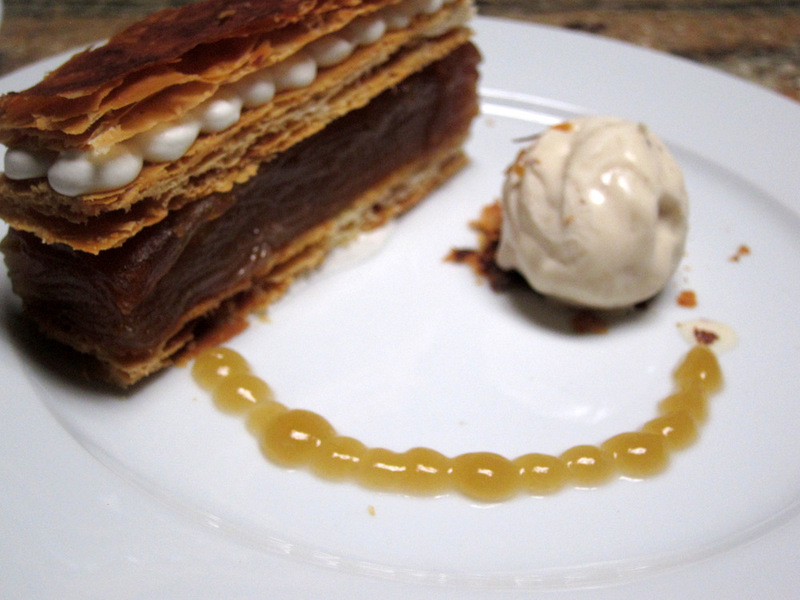 The ice cream that went with the mille feuille is my own recipe. I wanted something with a tart flavor and almost a bit savory. I knew it would include homemade buttermilk and was thinking of maybe using some yeasted cream as well similar to what I used with this waffle dessert. That’s what brought waffles to mind, specifically yeast waffles, not the quick baking powder ones. I love a recipe for yeast risen waffles from Shirley Corriher’s classic book CookWise that she aptly labels “Crisp-crusted, feather-light raised waffle”. So I made some of that and as usual I used oat flour for about a quarter of the flour in there and used buttermilk instead of milk. I then allowed the waffles to completely dry and crisp in a warm oven eventually ending up with about 100 gr of waffles, crumbled. I soaked these in a mixture of cream and whole milk overnight and then strained them out. Then I proceeded to make the ice cream using my go to method per Jeni’s Splendid Ice Cream book. When the ice cream base was cool I stirred in a 100 gr of buttermilk, allowed the mixture to cool in the fridge and then churned it into the most amazing buttermilk waffle ice cream. The cream under the top caramelized puff pastry layer is simple sweetened whipped cream flavored with Laird’s apple brandy. That goes on the plate in a few dots first to anchor the first layer of pastry, then goes a rectangle of apple confit, then more pastry, the Laird’s cream and the caramelized pastry. The green-ish sauce around the dessert is just Granny Smith apple juice thickened lightly with Xanthan gum and it gives the dish a nice fresh apple flavor. I have a lot of cookbooks. By some measures too many but compared to others really not that much. If a book adds one or two recipes to my rotation that everyone loves in my family then it has done it’s job. Better books add more to the mix like a new technique, ingredient or some tips and tricks. A select few books might not add anything to my general knowledge but are a lot of fun to read or flip through. Any book that does not have any of the above is quickly returned to the bookstore or sold at Half-Price Books. Honestly, I rarely encounter any of that last type because I do a bit of research into what I buy. Heston Blumenthal at Home is a book that combines many of the criteria above. It is modern, but rooted in many classics (Shrimp Cocktail, liver parfait, chilli con carne). The recipes for the most part are refined but not daunting and are hallmarks of Blumenthal’s perfect technique. More importantly, every chapter opens with a concise and simple to understand introduction of each topic (Sous vide cooking, Frozen desserts). If you ever wanted to know how to make exceptionally smooth ice cream and sorbet using dry ice (and a KitchenAid mixer) then this is the book for you. The reason I decided to post about the book though is that it added at least two awesome recipes to my family rotation and this salmon is one of them – chicken braised with sherry and cream is the other one. I credit this recipe with opening my two boys’ eyes to how delicious well-prepared salmon can be. Now, when they say they want salmon for dinner they mean Mr. Blumenthal’s recipe, but also they actually order salmon when we are eating out now. I could not ask for more. The actual original recipe, as Blumenthal mentions in the intro to the sauce, belongs to Michel Roux a very well-respected Michelin starred chef. Roux’s son and nephew are also high caliber chefs by the way. 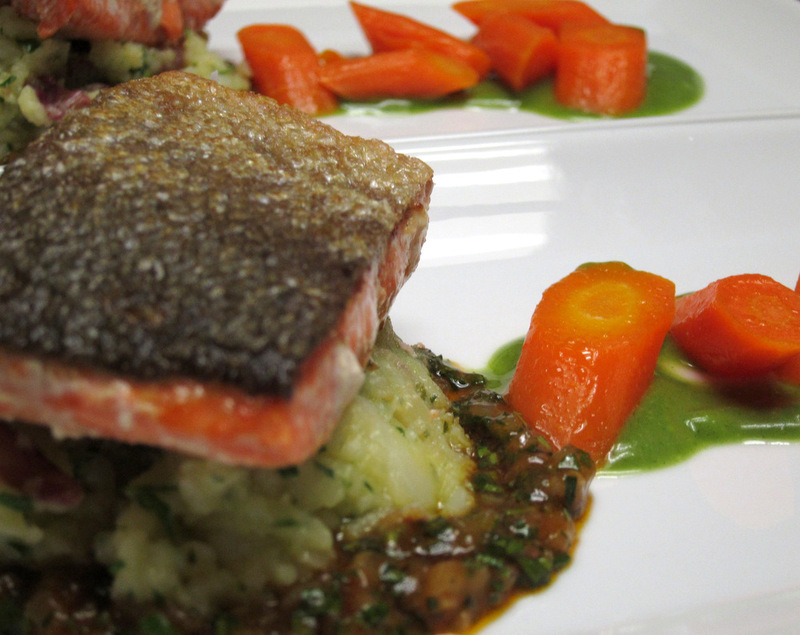 Anyways, the recipe in the book has three components; salmon cooked sous vide and crisped, smashed potatoes and the lovely sauce. The fish is bagged with the skin on along with a bit of olive oil and cooked in a water bath at 50 C for about 20 minutes. 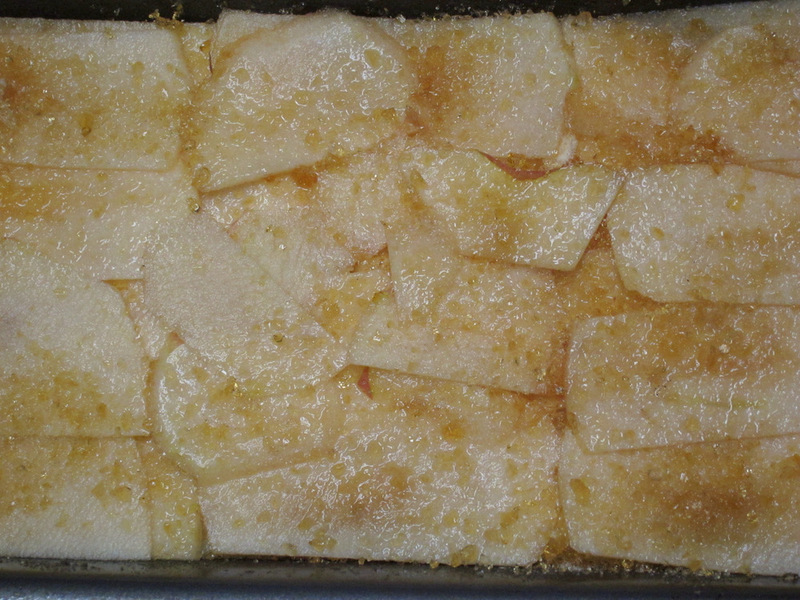 Before serving, the skin side is patted dry and crisped in a pan. The fish is meltingly tender and the skin becomes nicely crisp and brittle. If you skip the crisping step the skin really has to be removed since it is kind of flabby and not pleasant right out of the plastic cooking pouch. 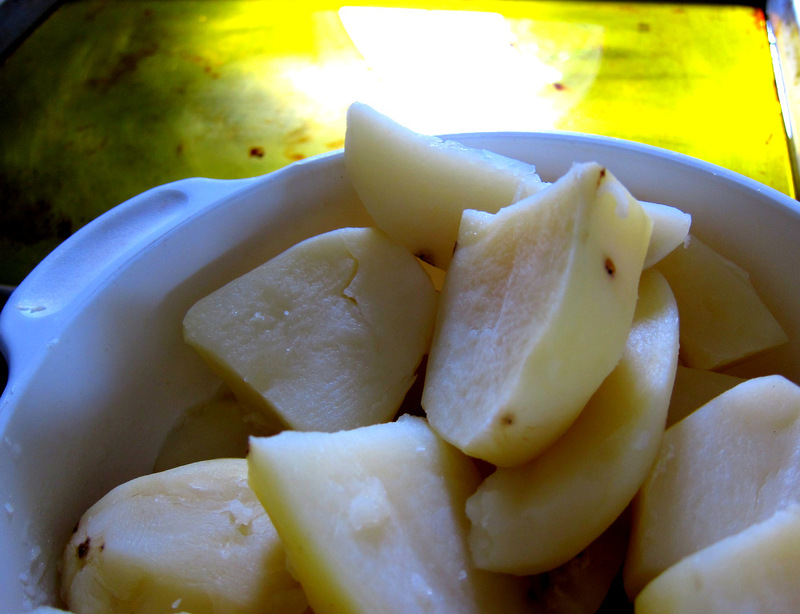 The crushed potatoes are just boiled yukon gold potatoes that are sqaushed with a fork or large spoon. 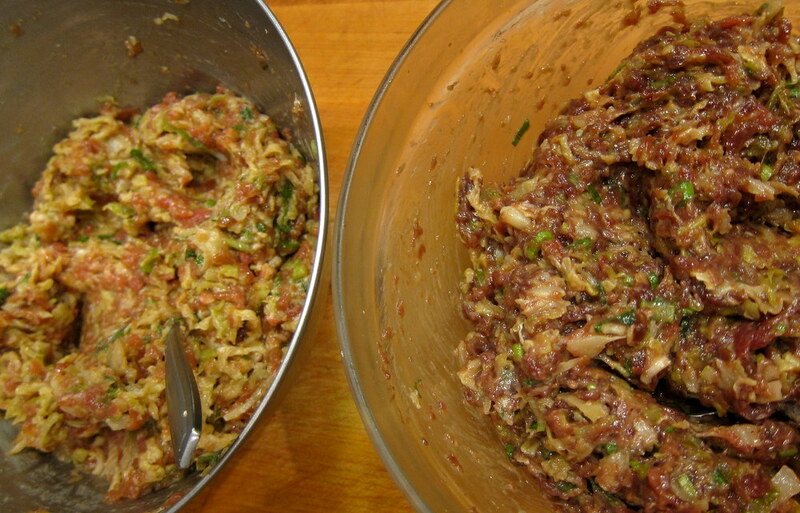 Then a mixture of sauteed shallots, whole grain mustard, olive oil and herbs (tarragon, parsley, chives) are mixed in. The potatoes are delicious and have an excellent texture. The Bois Boudran sauce is an interesting one. 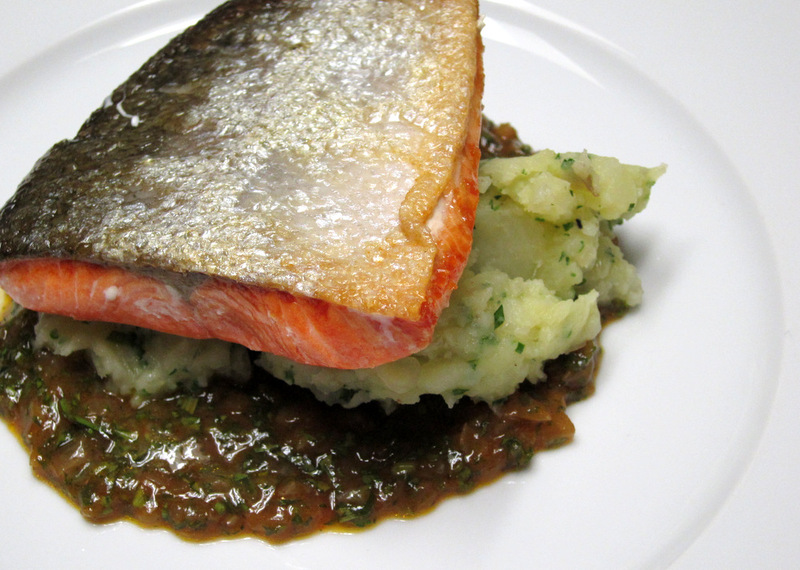 At first I was a bit skeptical with the ingredient list: Ketchup (yeap, plain old ketchup), olive oil, vinegar, Worcestershire sauce, shallots, tarragon, parsley, Tabasco sauce,… Served with the fish and potatoes though the sauce is damn tasty. It has the sour, sweet, spicy flavors working in harmony along with a nice crunchy texture from a load of shallots that are briefly blanched in boiling water to take the edge from them. Usually, I simply serve the plate as is with sauce, potatoes and fish but once in a while if I have some time I might add a salad or maybe a bit more elaborate side. This one is carrots cooked with butter and carrot juice based on a recipe from Thomas Keller’s Ad Hoc at Home. As for the brilliant green sauce it’s made from green carrot tops courtesy of Michel Richard’s Happy in The Kitchen book. The leafy carrot tops that are normally discarded have a ton of flavor. I just blanch them in boiling water and shock them in ice water. Then they are pureed with some water or stock and butter is added along with some lemon juice and salt. After straining it was a bit loose, so I thickened it with a little Ultratex-3. 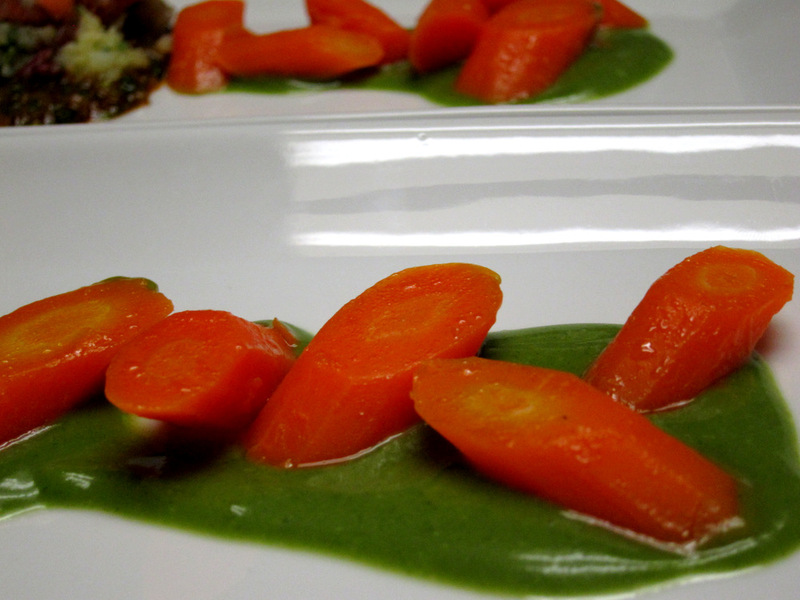 The sauce has a brilliant flavor and of course it works great with those carrots. Really give it a shot next time you buy carrots with the greens still on. 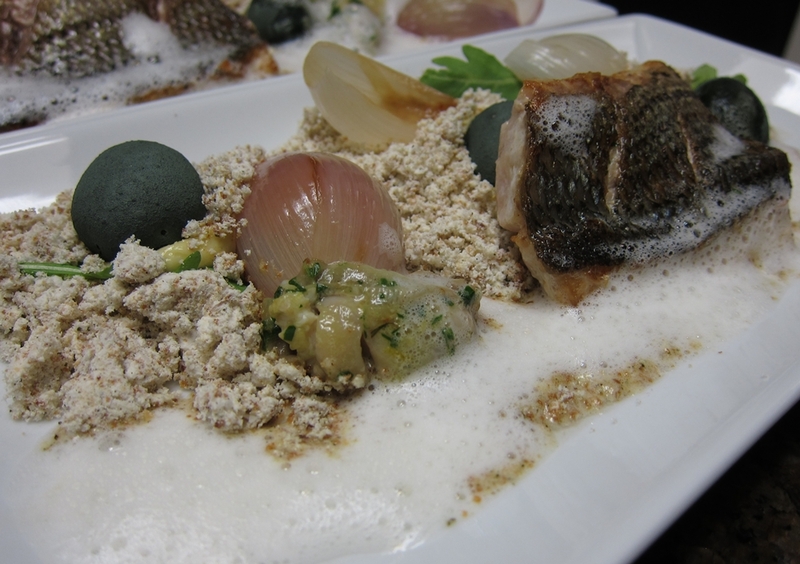 This dish came about because of the edible stones from Mugaritz that I posted about recently. I did not want to spend a good bit of time making the potatoes to look like stones just to serve them as is, a bite or two of food. So, why not spend much more time and incorporate them into an actual dish? the potatoes reminded me most of beach or river stones so fish was the first to come to mind. 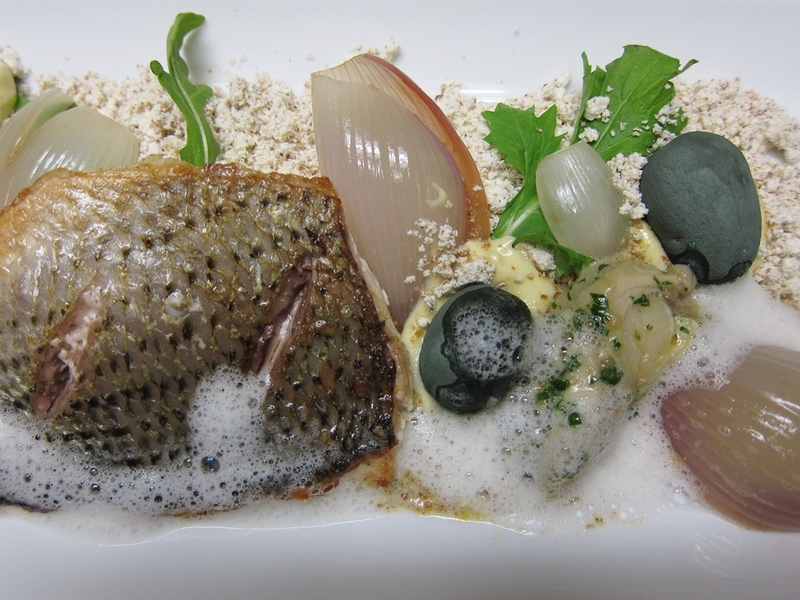 Then of course I remembered Heston Blumenthal’s very famous “Sound of the Sea” dish at the Fat Duck. that dish has a variety of seafood, served on a “beach” complete with sand, sea foam, weeds, shells and to gild the lily an iPod! The iPod plays gentle beach and wave sounds as the diner enjoys the dish. The idea is that all of our senses are related and that we are much likely to enjoy the dish if every sense was immersed in the experience. Another of Blumenthal’s findings regarding sound and food: potato chips seem much crunchier and fresher if you eat them while listening to crunchy sounds? Anyways, back to the dish. I made my beach scene based on the recipe from the Fat Duck but simplified it a good bit and went with what I had. The “sand” mixture from the Fat Duck includes powdered kelp, blue shimmer powder (no idea what that is), carbonized vegetable powder (I’m pretty sure this is burned vegetables), dried baby eels, fried Panko bread crumbs, tapioca maltodextrin, spices, salt,….I stuck with the bread crumbs, the powdered kelp, ground up hazelnuts, black pepper and the maltodextrin. Really the maltodextrin is the one that gives it a perfect sandy texture and make it just melt in the mouth when eaten. So, it is essential here. For the seafood, I wanted at least one fish and a shellfish or two. I intended to use clams and mussels for the shellfish but the couple of stores I went to did not have any decent ones. So, I settled on good quality shelled packaged oysters from Louisiana. For the fish I stopped by a favorite of mine, a large Asian grocery store that always has excellent whole fresh fish in addition to a few live ones. The striped bass looked the best so I picked one and asked the guy behind the counter to gut and scale it but leave it whole. When I got home I rinsed the fish well and filleted it. This gave me 4 nice bass portions. It also gave me some bones and the head to make stock that I need for the sea foam sauce. I made the fish stock sous vide for the first time per the instructions in the Modernist Cuisine at Home book. I packaged the bones and head with a lot of aromatics and some white wine and vermouth and cooked it at 80 C degrees for 1.5 hours. 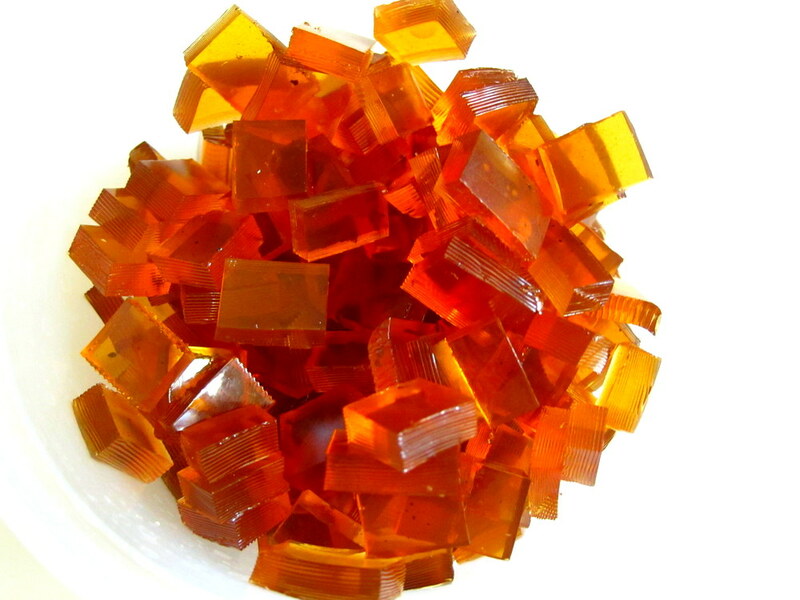 It made for a marvelous stock with clear color and a perfect flavor. Fish stock should not simmer much or boil at all so cooking sous vide makes perfect sense. It also eliminates evaporation which concentrates the flavor by not allowing any aroma to dissipate into the air with the steam. Another stock by the way that is amazing prepared sous vide is vegetable stock. 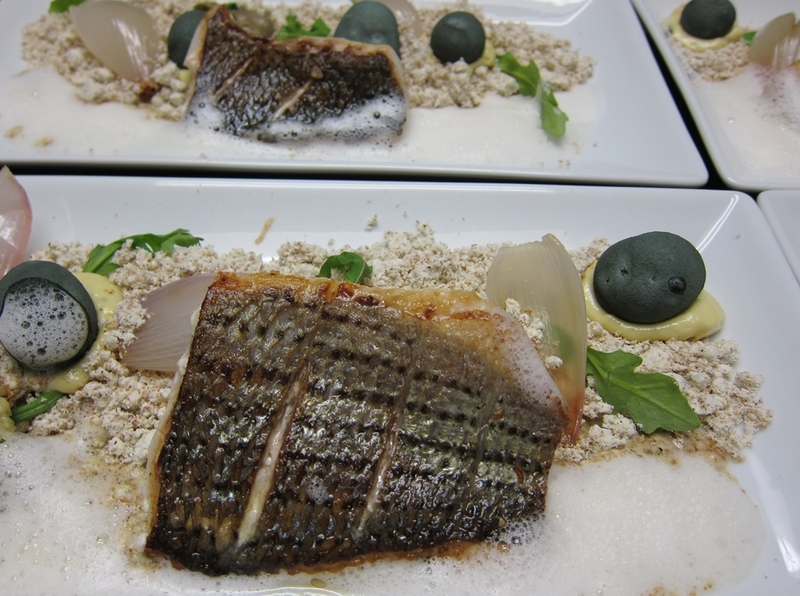 I cooked the fish sous vide and crisped the skin right before serving. For the oysters I also cooked them sous vide but included a good dose of garlic and parsley butter in the bag. 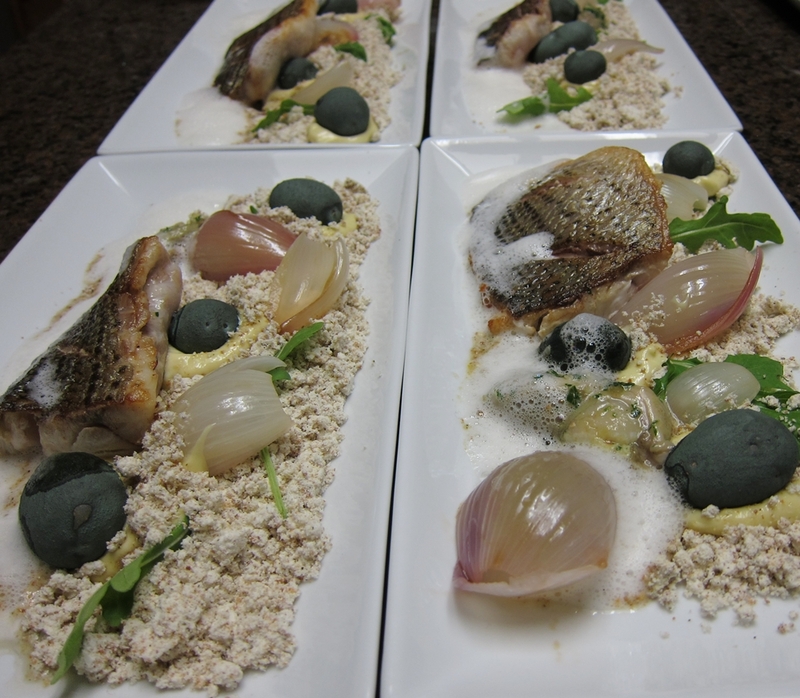 With the seafood cooked, the “stones” and alioli good to go, the “sand” is ready and my fish stock is prepped, I focused on finishing the sauce which forms the beach foam as well as preparing some “shells”. The shells are shallots that I separated out and poached till tender. Then I tossed them in some Ponzu sauce right before serving. For the sauce, I warmed the fish stock and mixed in the juice from the oysters then seasoned it with soy sauce, salt and pepper. To finish it and foam it a bit I added soy lecithin and blitzed it with the hand blender. To plate the dishes, we (since I was preparing several plates Diana helped a lot with plating) put the “sand” down on one side of the plate and then added a few dollops of the alioli on top for the “stones” to sit on. Then on the side of the sand went the fish and oyster followed by the foamy sauce on the edges of the sand. Then the garnishes went on including the “shell” shallots and a few green leaves as a stand in for sea weed that I had not time to shop for. It all worked great and my in-laws who stopped by for dinner that evening enjoyed their whimsical meal very much. It’s always a relief when experimental dishes like this one work out when guests drop by and we don’t have to order pizza or something. The plate had a lot of flavors that worked perfectly and of course a lot of textures ranging from crunchy to soft to somewhere in between.